The people who were chosen by their communities to become barefoot doctors studied anatomy, bacteriology, disease diagnosis, acupuncture, family planning, maternal and infant care, and traditional and Western medicines with teams of medical staff. All received a barefoot doctor’s manual – a comprehensive guide to the many health issues they were trained to treat. 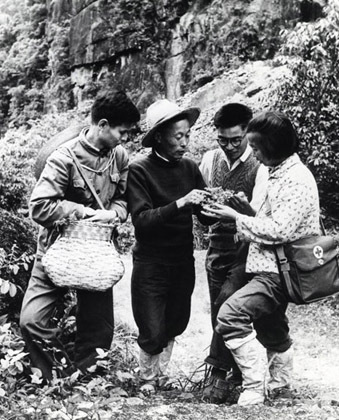 qualified doctors were sent from the cities, as part of their social obligation, to work with them – in other words, social obligation was fundamental to Chinese health care. Doctors in Australia have been extremely reluctant both to give up any of their procedures to those less qualified and to accept a perspective on health care other than one consonant with their mantra of ‘evidence-based’ (so often shown to amount to pro-the drug industry and pro-surgery, and often amounting to the rejection of evidence), arguing a concern for patient safety. The reluctance, even refusal, still, of Western doctors to have an wholistic approach to health care and medicine (contrary to all the evidence), to appreciate the relationship between how a person thinks and feels and the health of their body would be incomprehensible if one didn’t see the forms for surgery and all the little hand-outs from drug companies on their desks. I have no doubt that the traditional methods and ways of thinking (communal and grounded in nature) of Australia’s Aboriginal people would have a great deal to offer in this regard. Precisely because the ethic of the barefoot doctors represents an approach to health care contradictory to the nature of capitalism (socialist, not exploitative and profit-driven), the lessons they embody will most probably be lost on a capitalist West. I understand that with the gradual loosening of economic constraints in China (a necessary but complex and delicate development that the Chinese have so far managed very well since a process of reform was initiated by Deng Xiaoping) the Western view of health care is also, most unfortunately, (re)gaining influence. 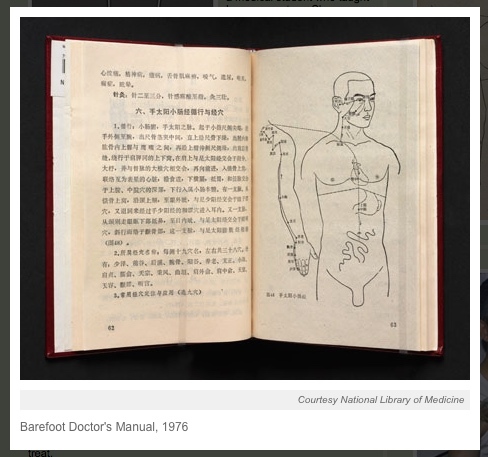 This entry was tagged acupuncture, barefoot doctor, China, Chinese culture, doctors, herbal medicine, individualism, philosophy, socialist ethics, wholism. Bookmark the permalink. “Doctors in Australia have been extremely reluctant both to give up any of their procedures to those less qualified and to accept a perspective on health care other than one consonant with their mantra of ‘evidence-based’ (so often shown to amount to pro-the drug industry and pro-surgery, and often amounting to the rejection of evidence), arguing a concern for patient safety. Just want to add that the same value differences reflected by the different approaches China and Australia take in the care of healthcare, also exists in other areas such as education and media. I take (and appreciate) your point. People in Australia talk about ‘the undermining of the public health system’ and the growth both in ‘private health’ (an oxymoron if ever there was one) and the costs of it; they talk about ‘the undermining of the public education system’ and the growth both in ‘private education’ and the costs of it, but what is taking place in both areas is that the nature of capitalism is becoming more overt, particularly as its post GFC crisis remains unresolved, if not is deepening (consider the implications of yesterday’s elections in Greece).